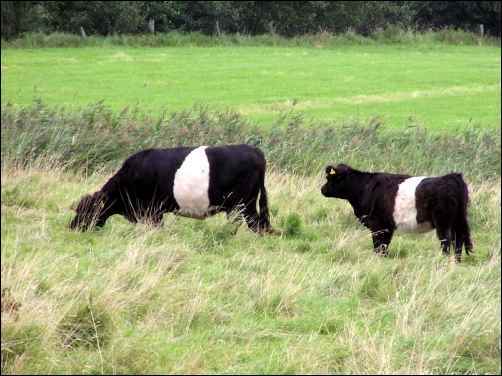 The “Belted Galloway”, a hardy breed of Scottish Cattle, is distinctive because of the belted, white band evenly distributed around the mid section of the otherwise totally black animal. Many breeders and cattle fanciers refer to the “belties” as Oreo-cookie Cows. Galloways have a long and distinctive heritage as being considered one of the oldest cattle breeds in the world. Belted Galloways belong to the family of Galloway Cattle which today include solid whites, and blacks. Back in the 1700’s when this breed was first being selected and bred for its many fine qualities, other colors existed; reds, duns, spotteds and brindles were commonly seen. However, by the mid-1800’s, cattlemen had made the decision to choose solid black as the preferred select-breeding coloration. The Belted coloration became popular around the turn of the 19th century, and in 1921, a registry was established for the belted coloration of Galloways. The distinguishing factors for Belted Galloways require that to be considered a true “beltie” and registered as such, the cattle must have a wide, even band of pure white fur completely encircling the animal’s mid section. The rest of the cow, back and front, must be solid black with no white anywhere else on its body or face. Belted Galloway breeders are watchful in selecting breeding animals to make sure that white feet, which is considered an undesirable breed marking, to be bred out. Canada saw the first imports of this attractive breed in the early 1950’s, by H. Gordon Green. Eastern Canadian provinces such as Ontario and Quebec today, have the largest concentration of these animals; Saskatchewan and Alberta have very few breeders, which make Belted Galloways much sought after in the Prairie and Western provinces. This extremely hardy and dual-purpose breed are considered perfect cattle for the harsh and long Canadian winters which exist in most of Canada. Belted Galloways are very hardy, covered in a dual hair coat that all Galloways possess. A short, velvety and water resistant undercoat acts like a downy insulation, protecting these cows from dampness of any kind. The long, course, and curly outer guard hairs protect them from cold, making these animals a wonderful breed for adaptation in Northern climates. Even their ears have unusually long fur resembling attractive fringe, protecting their ears from frostbite. Galloways are considered to be extremely superior and efficient feed converters, who will consume less and forage independently well on more varieties than many other cattle breeds. Their meat is well marbled and known to be considerably low in saturated fat content. Belted Galloways are also considered to be excellent milkers as well. Their superior mothering abilities and the activeness of the newborns succeed in making for a high survival rate. They are also distinguished for their docility and ease of handling, and for their genetic predisposition and resistance to diseases such as pink-eye, as well as the many foot problems experienced by other breeds of cattle. One drawback of the breed is that Belted Galloways do take a longer time than other commercial cattle breeds to mature and gain their fully grown weight range of 1000 to 1100 pounds. Because of their slower growth, cows should not be first bred until the age of two years as they will likely experience birthing difficulty resulting from their small size as a yearling. Average single-calf weight is around 70 lbs, and a healthy, well-marked weanling can bring around $1500 and up at present market prices. Canadian high standards of this breed have aided the production of these Canadian born offspring’s popularity in the United States, where purchases of Canadian calf crops are high in demand and often pre-sold to American breed fanciers. Although the appearance of the Belted Galloways makes them largely a distinct hobby cattle, the breed clearly possesses many sought-after qualities aside from attractive coloration, that makes them a viable commercial venture. Many ranchers seek to find a good dual purpose breed that will thrive and have utilitarian aspects making them worth breeding and raising; but as well, cattle fanciers looking for something that is a little different, pleasing to the eye, and unique amongst the ordinary, run-of-the-mill herd cattle will find “belties” to more than fit the bill. Belted Galloways are certainly considered to have all the desired cattle traits by those who raise them, and their popularity and demand certainly attests to their profitability and marketability. Belted Galloway Cattle is certainly a breed that has garnered itself this excellent reputation, for all the many wonderful qualities in the breed description. And besides, what cattle fancier could resist the Oreo-cookie Cow? !